Site thick with weeds before work began in 2000. 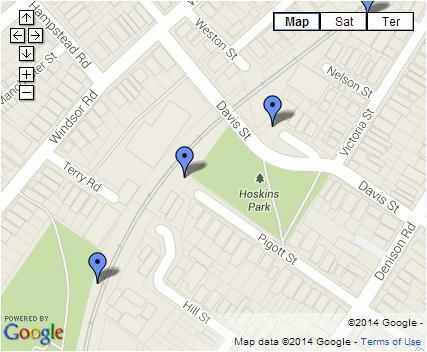 The Pigott St site is practically a continuation of Hoskins Park in Dulwich Hill. Only a wire mesh fence and the stormwater channel that becomes Hawthorne Canal separate the two. The site measures about 80m by 20m and is bounded by the light rail line, the stormwater channel, Davis St bridge and some houses on the southeast boundary. 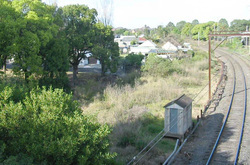 It is RailCorp land but Marrickville Council is licensed to use it and IWEG works there under the council’s auspices. The site in 2012 is well established. The Pigott St site was planted with about 50 local-provenance species when it was established in May 2004. Fortunately, the site has no overhead transmission lines so we have been able to plan several tree species, including Grey Ironbark (Eucalyptus paniculata), Red Ironbark (Eucalyptus fibrosa) and the iconic Turpentine (Syncapria glomulifera). Native grasses and shrubs are now starting to self seed, but there is still a lot of work to be done. 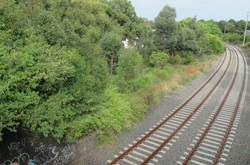 A significant portion of the site (and especially the Davis St embankment) is still dominated by a range of weeds and natives have not yet been established. Volunteers enter the site through a gate at the end of Pigott St. The site has no water supply so we want Marrickville Council to install a tap in Hoskins Park near the site entrance in Pigott St.